SUBHEAD: And when it happens here, it will spread through the financial systems of the world. Image above: Scene from the movie "The Road" based on the novel by Cormac McCarthy. From (http://www.enclavedecine.com/2010/02/la-carretera-road-2009-de-john-hillcoat.html). I had a fellow on my latest podcast, released Sunday, who insists that the world population will crash 90-plus percent from the current 7.6 billion to 600 million by the end of this century. Jack Alpert heads an outfit called the Stanford Knowledge Integration Lab (SKIL) which he started at Stanford University in 1978 and now runs as a private research foundation. Alpert is primarily an engineer. At 600 million, the living standard in the USA would be on a level with the post-Roman peasantry of Fifth century Europe, but without the charm, since many of the planet’s linked systems — soils, oceans, climate, mineral resources — will be in much greater disarray than was the case 1,500 years ago. Anyway, that state-of-life may be a way-station to something more dire. Alpert’s optimal case would be a world human population of 50 million, deployed in three “city-states,” in the Pacific Northwest, the Uruguay / Paraguay border region, and China, that could support something close to today’s living standards for a tiny population, along with science and advanced technology, run on hydropower. The rest of world, he says, would just go back to nature, or what’s left of it. Alpert’s project aims to engineer a path to that optimal outcome. Obviously, my own venture into the fictionalized future of the World Made by Hand books depicted a much kinder and gentler re-set to life at the circa-1800 level of living, at least in the USA. Apparently, I’m a sentimental softie. We do agree with basic premise that the energy supply is mainly what supports the way we live now, and that it shows every evidence of entering a deep and destabilizing decline that will halt the activities necessary to keep our networks of dynamic systems running. A question of interest to many readers is how soon or how rapid the unraveling of these systems might be. When civilizations crumble, it tends to fast-track. The Roman empire seems to be an exception, but in many ways it was far more resilient than ours, being a sort of advanced Flintstones economy, with even its giant-scale activities (e.g. building the Coliseum) being accomplished by human-powered work. In any case, the outfit really fell apart steadily after the reign of emperor Marcus Aurelius (180 AD). The Romans had their own version of a financialized economy: they simply devalued their coins by mixing in less and less silver at the mint, so they could pretend to pay for the same luxuries they had grown accustomed to as resources stretched thin. Our financialized economy — like everything else we do — operates at levels of complexity so baffling that even its supposed managers at the central banks are flying blind through fogs of debt, deception, and moral hazard. When that vessel of pretense slams into a mountain top, the effects are likely to be quick and lethal to the economies on the ground below. In our time, the most recent crash of a major socioeconomic system was the fall of the Soviet Union in 1990-91. Of course, it happened against the backdrop of a global system that was still revving pretty well outside the USSR, and that softened the blow. Ultimately, the Russians still had plenty of oil to sell, which allowed them to re-set well above the Fifth Century peasant level of existence. At least for now. The Soviet Union collapsed because it was a thoroughly dishonest system that ran on pretense and coercion. Apparently, the US Intel Community completely missed the signs that political collapse was underway. They seem to be pretty clueless about the fate of the USA these days, too. If you consider the preoccupations of two very recent Intel chiefs — John Brennan of CIA and James Clapper, DNI — who now inveigh full-time on CNN as avatars of the Deep State against the wicked Golden Golem of Greatness. Of course, I expect the collapse to express itself first in banking, finance, and markets — being so deeply faith-based and so subject to simple failures of faith. But it will become political and social soon enough, maybe all-at once. And when it happens in the USA, it will spread through the financial systems the whole world round. SUBHEAD: Review of book by David Holmgred on a resilient future for today's suburbanites. Image above: Photo enactment of living in RetroSuburbia from the original article. Navigating a way to a safe, nurturing and liveable future requires our coming together to create "what if?" spaces, places and events where we can come together with others to ask those questions. The Transition movement, for me, has always been one of those spaces, the invitation for people to join up with others to look at their place through what if lenses. David Holmgren’s new book is a fascinating, and intoxicating blast of "what if?" which ought to be put through every suburban letterbox in the world, although given its size I have doubts that it would fit. I am a huge Holmgren fan. ‘Permaculture: principles and pathways beyond sustainability’ changed my life. The "what if?" at the heart of RetroSuburbia is “what if our suburbs were reimagined and repurposed to be sustainable, productive and vibrant?” Good question. It takes his ‘permaculture flower’ at its basis, as the lens through which it looks at the possibilities of how the suburbs could be if catalysed with imagination and possibility. Although written very much for the Australian context, there is much in its almost 600 pages to inspire suburban permaculturists anywhere. 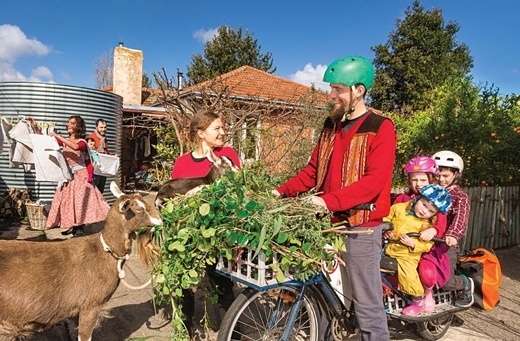 There’s a treasury of Holmgren insight on topics from retrofitting your house, harvesting water and storing food, to setting up a food garden, managing with less than perfect urban soils, working with animals in the suburbs and maximising diversity. You’ll find guidance on different models of living together, making decisions, creating a livelihood, reimagining your family finances, planning for disasters, ‘rearing self-reliant and resilient children’ and so much more. While ‘Permaculture’ was a book that had so many brilliant ideas it struggled sometimes to imagine that you might need some time and space, or some nice photos even, to be able to digest them, ‘Retrosuburbia’ is a different beast. Presented in full colour it is rich with photos, case studies from his own life and the lives of people he knows, every page drips with ideas, experience and advice with dirt beneath its nails. A couple of years ago, David and I debated publicly his ‘Crash on Demand’ paper, where he declared that “an argument can be mounted for putting effort into precipitating that crash, the crash of the financial system”. I disagreed, arguing that we needed to be very careful what we wish for. What I love about ‘Retrosuburbia’ is that the concerns that underpinned that paper are still present here, but beautifully couched in an utterly practical, utterly convincing vision for the suburbs. It is the perfect riposte to anyone who says “permaculturists/Transitioners/greenies just want to take us back”. Although that’s always a lazy and rather pointless accusation, this book shows a way forward in which human culture, in all its aspects, can flourish. This is my vision for the future. It’s beautiful, it’s delicious, and it’s entirely possible. You want ‘Take Back Control’? In these pages, you got it. This book will become the banner, the standard, around which people everywhere reimagine their future and then make it happen. And written on that banner? Two words. “What if?”. Video above: Brief description of "RetroSuburbia" by David Holmgred. From (https://youtu.be/lm0eT1EMh4w). IB Publisher's note: If you are interested in seeing a "Flip-Thru" of the pages of the book please visit the original review. SUBHEAD: Polynesian subsistence use of the land and sea resources may conflict with "independence". 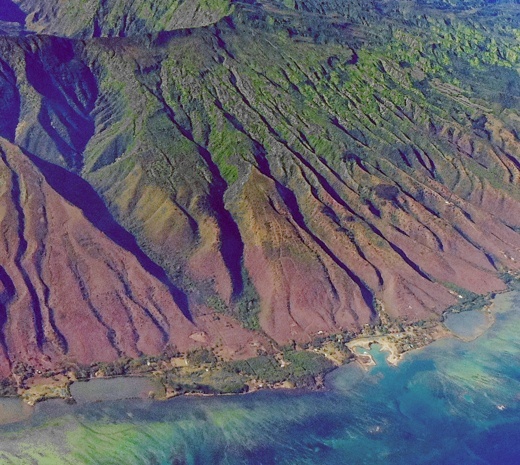 Image above: Aerial view of the south eastern shore of Molokai showing fishponds and seaside living typical to the area. From original article. If you wanted to eat, you had to work. That’s how Kaui Kapuni Manera was raised on the Hawaiian island of Molokai in the 1960s. As one of seven children brought up by her grandparents, Manera contributed to every meal by scouting for fish, gathering edible seaweed or harvesting from the star fruit, guava, and breadfruit trees that grew in abundance on the family’s two-acre plot edging the sea. “When momma said ‘go out there and get lunch’ she meant it,” remembers Manera, now 61. “If she told us to go out and pick limu, it was an all-day job. If we walked to the school, we were expected to carry oranges home in our shirts. It wasn’t until the family dinner started to include those fashionable Spam cans that Manera realized she lived in poverty. “When my grandfather passed away, there was no one to raise the pigs or harvest the taro patch anymore,” Manera says. “My grandmother was blind, and we were just kids. So we started getting food stamps. Once an object of yearning, Spam became a flag of the shame born of needing U.S. government assistance. Nevertheless, Manera savored the salty meat that replaced her grandfather’s hand-pounded poi and fresh-caught fish. On Molokai, where more than 60% of the island’s 7,400 residents are of Native Hawaiian descent, a longtime rejection of Americanization and urban development has kept alive a way of life that closely resembles that of traditional Polynesia. And because Molokai has fewer visitors than any other Hawaiian island, as well as the largest indigenous population in the state, it is one of the only places where the authenticity of Old Hawaii is said to still exist. Of course, when you reject modernization, you risk limiting economic growth. Today, on this island without traffic lights, the trade-off of a simple, down-home lifestyle that’s still largely intact is that good work is hard to find. An island-wide job shortage, coupled with the reality that many of the jobs that do exist fail to offer a livable wage, has bred a generation that relies on a combination of government assistance and traditional subsistence living practices to get by. “A lot of Hawaiians who depend on government assistance are pissed because it doesn’t provide a great life, and a lot of the Hawaiians who don’t are pissed because it’s hard to get on without it,” Manera says. This is the backdrop to which a fiery political debate over Hawaiian sovereignty is erupting. Indeed, the debate has been flaring since the 1893 overthrow of the Hawaiian Kingdom by the U.S. government. What’s different now is that Native Hawaiians are for the first time being presented with a new means of attaining some degree of political autonomy. In September 2016, Native Hawaiians won access to a new process by which the United States would form a government-to-government relationship with a unified Hawaiian nation. Previously unavailable to indigenous Hawaiians, this brand of quasi-sovereignty through federal recognition has long been employed by Native Americans and Alaska Natives to bolster the political power of tribal nations. A shot at federal recognition is something that some Native Hawaiians have been fighting for—and other Native Hawaiians have been fighting against—for a very long time. Whether they’ll seize it, and how it might serve to ameliorate some of the injustices the Native Hawaiian community has endured in the last century, is yet to be seen. “People come here to see rainbows and jumping whales, but they learn pretty quick that there’s a lot more going on,” says Koa Kakaio, who is 30. A California-born Native Hawaiian who relocated to Molokai to discover his roots, Kakaio works jobs in construction and graphic design while also operating his own online apparel business. He is smart and enterprising, but despite working three jobs Kakaio still makes a paycheck-to-paycheck living. All told, 35% of Molokai’s population receives federal food aid, while more than a third of the residents report that they farm, hunt and fish to keep fed. Complicating matters further is that a century of deleterious colonization has bred a new reality in which far fewer Native Hawaiians own any of the lands on which their ancestors long cultivated an impressive bounty of food. Simply put, it’s harder than ever to carry out the old Hawaiian way of life on this tiny isle. Native Hawaiians no longer have access to much of the land that has been bought up by Asian and American businesses, federal and state government and transplants from places ranging from Kansas to the Philippines. Most no longer speak their native language that for a time was outlawed in Hawaii classrooms. Throw in widespread land degradation—the fallout of a defunct sugar and pineapple plantation industry—and a new and controversial biotech seed business that provides some of the island’s only well-paying jobs, and you’ve got a web of political and cultural complications that not even this sleepy little island can escape. But more than a hundred years after Hawaii’s last monarch was imprisoned in her palace and forced to abdicate the throne, some wonder whether they can trust Washington’s motives in offering to strengthen the political autonomy of Native Hawaiians through federal recognition. Proponents of federal recognition say achieving the nation-within-a-nation status under the U.S. government would eradicate at least this one injustice. Indigenous Hawaiians are the only Native group in the nation that have not been able to rebuild some semblance of political autonomy. Reversing this situation, supporters say, could help to empower the group, who, compared to Hawaii’s other racial groups, are disproportionately afflicted by illiteracy, incarceration, obesity, and homelessness. Apart from federal recognition, there are other roads to sovereignty. Total independence is a goal desired by many Native Hawaiians who argue that it’s still possible to force the U.S. government to retreat from the Hawaiian Islands by the order of an international court. “Anytime the usurper offers you something on a silver platter, I see it as bait,” says Mike Weeks, an advocate of total independence. Weeks, a Molokai native, routinely gives away 40 percent of the vegetables he harvests on his one-acre farm because there are plenty of hungry mouths but not enough folks with money to pay for it. Opponents of total independence insist that it’s naive to entertain the fanciful notion that the U.S. government and its military would actually pack up and leave these strategically located isles. If it did, critics say, the blow of losing American citizenship would leave Native Hawaiians scrambling for basic resources, such as food. Imports account for about 90 percent of what feeds Hawaii’s residents and tourists. In a recent push by Native Hawaiians to rebuild their political autonomy, nearly 90,000 Native Hawaiian voters became certified to participate in a 2015 election aimed at assembling a delegacy to write a constitution for a new sovereign nation. Organizers planned a month-long summit in Honolulu, where Native Hawaiians elected from around the globe would design a legislative structure and a bill of rights. Hawaiians could then move to legitimize their contract of self-governance by seeking recognition from the United States or an international governing body, such as the United Nations or the International Court of Justice in The Hague, Netherlands. But the U.S. Supreme Court ordered election officials not to count the ballots, prompting Native Hawaiian leaders to terminate the vote. The court order was triggered by a lawsuit by two non-Native Hawaiians who weren’t eligible to participate in the election, and four Native Hawaiians who argued that race-restricted voting is illegal. The lawsuit is still making its way through the courts. With the election called off, some candidates for delegate seats still chose to convene in Honolulu at an abbreviated convention, during which a document to steer self-determination was drafted. But without a means of conducting a legal vote, there was no way for Native Hawaiians to ratify it. A retired firefighter and Vietnam veteran, 67-year-old Bobby Alcain says he did not support the ambitions of those who convened to write a new Native Hawaiian constitution because, in his opinion, they fell too short. He wonders—unless Native Hawaiians are returned to the land that has been bought up by foreigners, how can a new constitution do anyone any good? Alcain’s coming-of-age as a Native Hawaiian was set in motion by his experience in the U.S. military. It was only after he suited up in uniform and went overseas that his mind opened to the idea that he was different from most of the other Army men he had fought alongside. “I thought I was a true blue American,” Alcain says. “But I had no idea who I was. When I came home to Hawaii, I spent a year in the library reading every book I could find about what it means to be a Hawaiian, and I realized that I wasn’t the same as the other guys. Today, at the small farm where he grows copious vegetables and fruit, Alcain welcomes anyone—friend, stranger or tourist—to visit and take freely from his harvest. In keeping with Native Hawaiian tradition, there’s just one rule—no one may take more than he or she alone can eat. In Alcain’s view, the most searing injustice of the U.S. takeover of the Hawaiian island chain is that so many Native Hawaiians have been removed from the land on which their entire culture is predicated. To care for the land and sea as ancestors is to fulfill the cornerstone of what it means to be Native Hawaiians, Alcain says. SUBHEAD: Minnesota Appeals Court rules climate activists can use a "necessity defense" in trial. 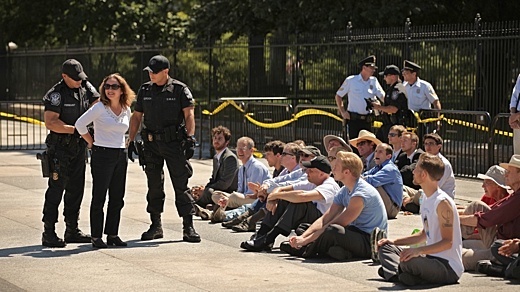 Image above: In front of the White House, on 22 August 2011, US Park Police officers arrest group of about 40 demonstrators protesting a tar sands pipeline. Photo by Chip Somadevilla. From original article. Does climate change pose such an imminent threat to the planet that it’s okay to break the law in order to stop it? Four climate activists currently awaiting trial in Minnesota for shutting off a tar sands pipeline think so — and on Monday, the Minnesota Court of Appeals agreed that they should be allowed to make that argument before a jury when their case goes to trial. “This is a big win for anyone who cares about climate change,” Kelsey Skaggs, a co-founder of Climate Defense Project and a member of the defendants’ legal team, said in a press statement. The climate activists who shut down the pipeline in Minnesota are part of a small group of protesters known as the Valve Turners, who each shut off a different pipeline across four states in a concerted protest on October 11, 2016. The protesters involved were arrested and charged with criminal charges ranging from trespass to criminal mischief, and each has tried to use a climate necessity defense in court to argue that their actions were necessary to head off a more immediate threat (in this case, climate change). In every state but Minnesota, judges have not allowed juries to acquit the Valve Turner defendants on the basis of necessity. That has lead to a mix of outcomes, from a conviction with jail time in North Dakota for one protester to a conviction with community service in Washington. The state of Minnesota quickly appealed that decision, arguing that allowing defendants to present evidence about climate change would have a “critical impact” on the case and severely undermine the prosecution’s odds at achieving a conviction. The Minnesota appellate court, however, disagreed, ruling on Monday that the defendants could mount a necessity defense. Despite Connolly’s dissent, the Minnesota court’s ruling means that the climate activists will be allowed to call experts to testify about climate science and the consequences that inaction could pose for the world — facts that the activists argue will help strengthen their argument that shutting down the pipeline was necessary to avert the worst impacts of global warming. As climate action remains stalled at the federal level, climate activists are increasingly turning to protest and civil disobedience to disrupt fossil fuel infrastructure projects around the country. With those acts of civil disobedience on the rise, more defendants are turning to the climate necessity defense — and some are even seeing the technique yield successful results. Earlier this year, for instance, a judge in Massachusetts found 13 pipeline protesters that were charged with trespass for disrupting pipeline construction in Boston not responsible on the basis of necessity — in other words, the judge ruled that the illegal actions taken by the protesters had been legally necessary due to climate change. But the West Roxbury, Boston defendants only presented their necessity defense to a judge; the Minnesota trial will be the first time that climate activists are able to present a climate necessity defense to a jury. Arguing a case in front a jury often helps attract more attention, and can help move public opinion, more than simply arguing a case before a judge. At the same time as climate activists are attempting to use necessity defenses to justify acts of civil disobedience, Republican lawmakers — supported by the fossil fuel industry — are seeking to impose harsher penalties for environmental protest in several states. In Louisiana, Pennsylvania, and Minnesota — all states with controversial pipeline projects currently under consideration — lawmakers have recently introduced bills that would allow prosecutors to charge individuals for “conspiracy” if they are involved in the planning of a protest that includes a civil disobedience component like trespass, even if they ultimately don’t participate in the protest itself. SUBHEAD: Americans don’t realize how fast the country is moving toward becoming a better version of itself. Image above: Illustration of "new" America by Mark Weaver. From original article. I have seen the future, and it is the United States. After a several-year immersion in parts of the country that make the news mainly after a natural disaster or a shooting, or for follow-up stories on how the Donald Trump voters of 2016 now feel about Trump, I have a journalistic impulse similar to the one that dominated my years of living in China. That is the desire to tell people how much more is going on, in places they had barely thought about or even heard of, than they might have imagined. In the case of China, that impulse matched the mood of the times. In the years before and after the world financial crisis of 2008, everyone knew that China was on the way up; reporters like me were just filling in the details. In the case of the modern United States, I am well aware that this message runs so counter to prevailing emotions and ideas as to seem preposterous. Everyone knows how genuinely troubled the United States is at the level of national politics and governance. It is natural to assume that these disorders must reflect a deeper rot across the country. And indeed, you can’t travel extensively through today’s America, as my wife, Deb, and I have been doing in recent years, without being exposed to signs of rot, from opioid addiction to calcifying class barriers. At the time Deb and I were traveling, sociologists like Robert Putnam were documenting rips in the social fabric. We went to places where family stories matched the famous recent study by the economists Anne Case and Angus Deaton of Princeton, showing rising mortality among middle-aged whites without a college degree for reasons that include chronic disease, addiction, and suicide. 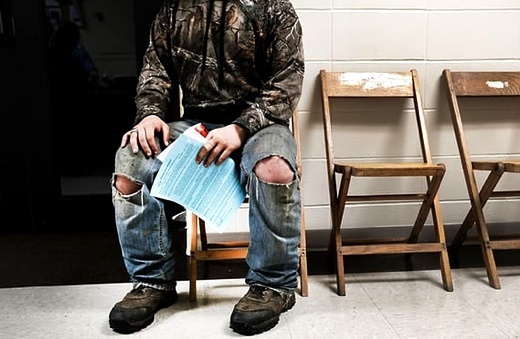 In some of the same cities where we interviewed forward-moving students, civic leaders, and entrepreneurs, the photographer Chris Arnade was portraying people the economy and society had entirely left behind. The cities we visited faced ethnic and racial tensions, and were struggling to protect local businesses against chain stores and to keep their most promising young people from moving away. The great majority of the states and counties we spent time in ended up voting for Donald Trump. What we learned from traveling was not that the hardest American challenges of this era are illusory. They’re very real, and divisions about national politics are intense. So we made a point of never asking, early on, “How’s Obama doing?,” or later, “Do you trust Hillary?” and “What about Trump?” The answers to questions like those won’t take you beyond what you’ve already heard ad nauseam on TV. Instead we asked people about their own lives and their own communities. Reporting is the process of learning what you didn’t know before you showed up. And by showing up in Mississippi and Kansas and South Dakota and inland California and Rust Belt Pennsylvania, we saw repeated examples of what is happening in America’s here and now that have important and underappreciated implications for America’s future. Serious as the era’s problems are, more people, in more places, told us they felt hopeful about their ability to move circumstances the right way than you would ever guess from national news coverage of most political discourse. Pollsters have reported this disparity for a long time. For instance, a national poll that The Atlantic commissioned with the Aspen Institute at the start of the 2016 primaries found that only 36% of Americans thought the country as a whole was headed in the right direction. But in the same poll, two-thirds of Americans said they were satisfied with their own financial situation, and 85% said they were very or somewhat satisfied with their general position in life and their ability to pursue the American dream. Other polls in the past half-dozen years have found that most Americans believe the country to be on the wrong course—but that their own communities are improving. What explains the gulf between most Americans’ hopeful outlook on areas and institutions they know directly and their despair about the country they know only through the news? Would it make any difference if more people understood that the local progress they see was not an isolated anomaly but part of a trend? I make no pretense that our proposed answers to those questions are precise or scientific. We traveled as broadly as we could. We listened; we learned. We were looking for civic success stories, and we found them. But we also ended up in places where well-intentioned efforts had failed. So we steadily adjusted our conclusions. We ended up convinced that the national prospect is more promising than we’d felt before we started—full of possibilities that the bleak trench warfare of national politics inevitably obscures. My own form of American nationalism, intensified both by living outside the country and by travels within it, arises from love of the American idea: inclusion, expansiveness, opportunity, mobility, the open-ended struggle to make the nation a better version of itself. America is becoming more like itself again. More Americans are trying to make it so, in more places, than most Americans are aware. Even as the country is becoming worse in obvious ways—angrier, more divided, less able to do the basic business of governing itself—it is becoming distinctly better on a range of other indicators that are harder to perceive. The pattern these efforts create also remains hidden. In an old battered metal-casting shop in Weatherly, in Carbon County, he talked to a nearly all-white crowd about the region’s loss of factory jobs and the need to bring them back. “This is about saving America!” he said. During the Pennsylvania part of Romney’s tour, which then went on to Ohio, we stayed in a cheap motel in the hard-luck coal-country town of Hazleton, where the median household income, in the low $30,000s, was much less than the national level of more than $50,000 and the unemployment rate, about 15% at the time, was much greater. The few visible signs of after-dark life were bodegas on downtown Wyoming Street, serving the city’s growing Latino population. When we got back from dinner at a small Mexican restaurant, we channel surfed to a local-access TV station and saw Lou Barletta, the longtime Republican mayor of Hazleton who had recently made it into Congress as part of the 2010 Tea Party wave, warn that ongoing immigration was a threat to Hazleton’s safety and quality of life. As mayor, Barletta had been a proto-Trump, championing a city ordinance that, among other anti-immigrant provisions, declared English the “official language” of Hazleton and required that official city business be conducted in English only. The measures were eventually tossed by federal courts. If Deb and I could have been transported one presidential-campaign cycle into the future, we would of course have realized that the conditions we saw in Pennsylvania prefigured what would become the standard explanation for Donald Trump’s eventual rise. The smaller communities with mainly white populations, where immigrants were cast as symbols of a threatening future and boarded-up storefronts and abandoned mill buildings served as humiliating daily reminders of lost economic strength—the main journalistic question, looking back at the 2016 results, was why such places would not have gone for Trump. Those days also prefigured a view of politics for us, but of a very different sort. After visiting Weatherly and Hazleton and their neighbors, Deb and I wondered why we hadn’t been to more such places, in other parts of the country. Traveling as frequently as we could outside the big cities had been our main approach to journalistic—and cultural, and personal—discovery during our years in China. Why not try a similar approach here? Starting in 2013, that is what we did, flying from town to town in our small propeller plane, which itself provided a close-up view of how cities fit into the American landscape. We reported on our findings along the way online and in print for The Atlantic, and a book about the results, Our Towns: A 100,000-Mile Journey Into the Heart of America, will appear this month. Skeptics will wonder at our wonder, and start by asking whether our impressions were distorted by a selection bias among cities. To some degree, sure. When we originally asked on The Atlantic’s website for suggestions of cities with instructive stories, we often heard about regional successes, or the more fortunate part of a compare-and-contrast pair. For instance: Burlington, Vermont, has had a more positive recent history than Plattsburgh, New York, its neighbor across Lake Champlain. The same is true of Greenville, South Carolina, whose collection of small, mutually competitive companies during the textile-economy era helped it adjust more nimbly to the post-textile age than the nearby city of Spartanburg, whose textile economy had centered on one giant firm. But as time went on we focused on harder-pressed places. In Mississippi, we spent weeks in some of its traditionally lowest-income areas. In California, we concentrated on the state’s most troubled city, San Bernardino, and one of its perennially least fashionable, Fresno. In central Oregon, we visited onetime lumber towns whose unemployment rates had been among the worst in the nation when the timber economy collapsed in the 1980s and again after the world financial crisis 10 years ago. We ended our journey in Erie, Pennsylvania, at about the time that Donald Trump was holding rallies there saying its economy was a symbol of American collapse. Wherever we went, we heard about efforts that had succeeded—and also those that had failed. During our travels I exchanged notes on Twitter with Chris Arnade about his photos (some published by The Atlantic) of people in a certain city being left behind and our profiles of the go-getters trying to move that same city ahead. Could these contrasting portrayals both be true? The answer, I think we agreed, is that we were trying in our complementary ways to portray parts of the contradictory American whole, which at every stage has involved both progress and cruel dislocation. Back during the “Morning in America” 1980s, I spent weeks in the Texas oil fields and in Michigan and Chicago’s South Side reporting on people who’d been displaced by trade and technology. To read American history is to know that in every era people have been forced to change occupation and location. Many of the Anglo families in my inland-California hometown of Redlands had left the South and the Midwest starting in the Dust Bowl years; many of the Latino families had fled north after the Mexican Revolution of 1910. Were we mistaking anecdotes and episodes for provable trends? This is the occupational hazard of journalism, and everyone in the business struggles toward the right balance of observation and data. But the logic of reporting is that something additional comes from traveling, asking, listening, seeing. This is particularly true in detecting a sense of changed course. A political movement, a new technological or business possibility—I have learned through the decades that enthusiasm in any of these realms does not guarantee world-changing success, but it’s an important marker. The visionary California entrepreneurs I wrote about in the 1980s were confident that their Osborne and Kaypro computers would change the world. They were wrong. The visionary California entrepreneurs I met at Apple in those same years were confident that their dreams would come true. They were right. And enthusiasm is what we have seen. This disparity in enthusiasm is especially striking in generational terms. Through American and world economic history, the cruel reality of technological dislocation has been that people who lose their jobs in middle age almost never become whole again, financially or socially. This is terrible, but it has always been true. It means that the obligation of an equitably growing economy is both to support people who have suffered economic damage and to do everything possible to improve prospects for their children. Thus we took it seriously when people in their 50s or 60s described what they’d lost when a mine or factory closed. But we also took it seriously, and as an indication of a community’s future prospects, when people in their 20s and 30s talked about the new opportunities they saw, from agriculture-related start-ups in Kansas and South Dakota to advanced-manufacturing ventures in Kentucky and Michigan. In what underpublicized ways is America moving forward locally and regionally, while we read only about chaos and discord nationally? Even as national politics induces distrust and despair, most polls show rising faith in local governance. For instance, surveys typically find that only a quarter of Americans trust the national government to “do the right thing,” but Gallup polls in 2014 and 2016 found that more than 70 % trusted their local government to do so. Part of this could be explained by people self-selecting into more-homogeneous communities. But in our experience it was true even in cities with significant racial and economic diversity, from Greenville to Fresno, Los Angeles, and San Bernardino. Mayors serve multiterm stints, launch long-range projects, realize that they’ll encounter in daily life their neighbors who pay the city’s taxes and rely on its services. I could spend the rest of this article describing initiatives that tech companies are launching and refining to improve the quality, responsiveness, and accountability of city services. Even as arguments about tax cuts or increases have degenerated into religious war at the national level, we saw them discussed in what you could call reasonable terms locally. Dodge City, in western Kansas, is very conservative in national politics. But everyone we met there stressed the importance of its “Why Not Dodge?” sales-tax increase, which citizens had approved in the late 1990s in a referendum. The proceeds had paid for parks, public swimming pools, and other facilities. In the same 2014 election in which West Virginia voters removed the very last Democrat from the state’s congressional delegation, the taxpayers of the capital city, Charleston, voted for a levy to sustain their public libraries. Even as the local and national economy collapsed in 2009, the mayor of Columbus, Ohio, urged his citizens to approve a tax increase rather than curtail city services and lay off employees, and they agreed. Even as the national discussion grows more hateful, the lived reality of absorbing immigrants and refugees has remained remarkably calm—in the cities where they have actually arrived. Pew, like other polling organizations, periodically asks Americans which national problems concern them most. Through the five years before Donald Trump’s election, immigration rarely made the top five. (The economy usually leads.) A Gallup poll conducted six months after his inauguration found that nearly two-thirds of Americans felt the level of immigration should either stay the same or go up. During the 2016 “Brexit” campaign, polls indicated that the communities in the United Kingdom most fearful of an immigrant presence were those where the fewest immigrants had ever come. American polls strongly indicate the same pattern. Whereas immigrants congregate in big cities such as Chicago and Los Angeles, many refugees are sent to medium-size communities that have specialized in assimilating them, a process we saw in, for instance, South Dakota, Vermont, Minnesota, and Pennsylvania, among other states. 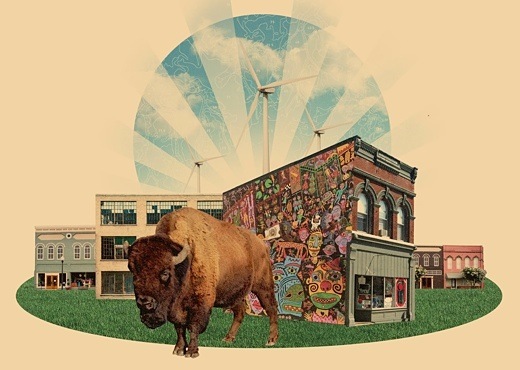 Midwestern industrial cities that have lost some of their home-born population have pushed hard for outsiders to revitalize them. Erie was a magnet for eastern-European and other immigrants during its manufacturing heyday, from the mid-19th through the mid-20th centuries. Now refugees, including recent arrivals from Syria, make up fully 10% of its population, and they supply much of its entrepreneurial energy. In 2006 a group called Welcoming Tennessee began celebrating the importance of immigrants and refugees to Nashville’s economy. It has spread to become Welcoming America, supporting immigrant and refugee settlement in more than 50 cities. Even as ambition, money, opportunity, and innovation cram ever more tightly into New York, San Francisco, Seattle, and elsewhere, a discernible “reverse talent migration” is taking place. In Wichita, Kansas; in Bend, Oregon; in Duluth, Minnesota; in Sioux Falls, South Dakota; in Fresno, we found people who had already worked in the most expensive and “elite” cities or who had been recruited for opportunities there, and decided instead that the overall life balance was better someplace smaller and less expensive. Steve Case, a co-founder of AOL and now the CEO of the technology-investment firm Revolution, has for several years led “Rise of the Rest” tours across the country to promote new tech businesses and support existing ones in places other than the famous tech centers. “For half a century, there’s been a brain drain, as people who grew up in the ‘rest of America’ left their hometowns for better opportunities elsewhere,” Case told me recently. Case himself grew up in Hawaii but built his companies in the Washington, D.C., area. Case points out that venture-capital support for start-ups is still heavily skewed toward the coasts. Nearly half of the total funds in the U.S. are directed to companies in California alone. But he says the balance is shifting, as part of a “third wave” of technology businesses (the first the building of the internet, the second the building of companies using it) based on applying advanced technology to “real” enterprises, from agriculture to health care to manufacturing. “It’s going to be more important to know how doctors work and farmers think and to build strategic partnerships,” he told me, “than just to work on coding and software.” The coding and software centers are in a handful of big cities. “Young people want to live in the city again, and they’re reviving it,” a tech-company founder named Doug Pelletier told us in Allentown, Pennsylvania, explaining why he had moved his headquarters from the suburbs to the long-troubled but improving downtown. It was a story we heard time and again. Igor Ferst, a Millennial engineer who had worked for Google and other famous companies in California, wrote us to describe why he and his wife had decided to move to Columbus. “The biggest improvement to our quality of life is not a lower median house price (though that doesn’t hurt),” he said. Even as Americans lament the decline of public education nationwide, and even as funding pressures remain acute—especially in Pennsylvania, whose funding system is the most cruelly inequitable, district by district, of any state’s—in most places we went people were eager to show us their innovative local schools. Some were public boarding schools, such as the “Governor’s Schools” we saw in Mississippi and South Carolina, where students from across the state live and study during part of their high-school years. Many schools worked with local employers to train students for decently paying jobs in culinary, architectural, mechanical, agricultural, medical, and other fields. Community colleges and universities increasingly provide the connective tissue among the components of a healthy regional economy: established companies, start-up entrepreneurs, academic researchers, and future employees. For instance, Wichita, which calls itself “the air capital of the world,” has large manufacturing complexes making Cessna and Beechcraft private jets and fuselages for Boeing airliners. Wichita State University runs the National Institute for Aviation Research, where I saw students and professors working on projects to improve aircraft design and reduce crash risks. Airbus recently moved a major engineering center into a new building on the Wichita State campus. Libraries might seem fated to become the civic counterparts of yesteryear’s Borders or Barnes & Noble, but in nearly every city we visited they were newly prominent. By most measures of use—classes and programs offered, daily attendance, visits to the website, everything except calls to reference librarians for the research people can now do on Google—libraries are becoming more rather than less popular and central to civic life. The soft measures of impact are powerful: Walk into a random public library, and you’ll see waiting lines for computers, librarians helping with job searches or other practical concerns, desk space for young entrepreneurs. According to a recent Pew survey, Millennials use libraries more than their Gen X or Boomer elders do. Even as Americans look out their windows from the Amtrak routes along the East Coast or from Midwest interstates to see derelict abandoned steel or car factories, almost every city we visited featured smaller advanced-tech workplaces. The federal government’s Manufacturing Extension Partnership, a modern counterpart to its long-established agricultural-extension programs, says it has worked with more than 1,000 successful manufacturing start-ups around the country. In Allentown, what was once the factory headquarters for Mack Trucks is now an incubator with a stream of new small companies. Going to the FirstBuild manufacturing incubator in Louisville, Kentucky, in 2016 reminded me of being in China—in a good way, for the intensity of maker-style innovation on the shop floor. FirstBuild was started by General Electric and is now owned by the Chinese appliance manufacturer Haier, but it still trains young workers and fosters new businesses in Louisville. Even as the country looks more homogenized and faceless in the parking lots of big malls, downtown by downtown it looks more distinctive and local. The Main Street America project of the National Trust for Historic Preservation reports more than 1,000 downtown-revitalization efforts now under way. Downtown reinventions that have already been successful—in places like Burlington and Greenville and Bend—illustrate the model of combining residences, shopping, and dining and entertainment for downtowns that are still on the way back, as in Allentown and Duluth and Macon, Georgia.liance manufacturer Haier, but it still trains young workers and fosters new businesses in Louisville. Even as Donald Trump’s federal government dismantles environmental protections and exposes national monuments and wildlife refuges to drilling, states, localities, and private donors are setting aside land for conservation at an impressive pace. But these efforts are a counterpart to the response that the governors of 16 states plus the territory of Puerto Rico and nearly 400 mayors made to Trump’s announcement that he was leaving the Paris Agreement: Their states and cities, which together account for more than half of U.S. economic output, would continue to observe the Paris climate goals. To a remarkable degree, political and journalistic portrayals suggest that coastal big-city America is the place where things happen. Washington means government, New York means finance, Los Angeles means entertainment, San Francisco and Seattle mean tech. As for people elsewhere, they’re the ones things happen to. Globalization, drought, layoffs, opioids—these are the blows that fall one by one on smaller-town and rural Americans. No wonder they’re so mad. But Deb and I have seen other kinds of things happening—and in these places, not just to them. There is of course evidence that this has happened, in the form of the bigotry that has been unleashed since 2017. In the months after Donald Trump took office, we checked back with communities where we’d met immigrants and refugees. Some places had seen a nasty shift, as Immigration and Customs Enforcement agents and police became newly aggressive and local racists felt empowered. A few months before the election, we interviewed Catholic nuns and secular volunteers in Garden City, Kansas, who were bringing surplus food and medical supplies to poor households, many of whose members were immigrants working in the area’s vast beef-packing complex. A few months after the election, a white-extremist hate group in Garden City was arrested while plotting to blow up an apartment building where African immigrants and refugees lived. In Dodge City, we met and wrote about a rising, respected young city-government official named Ernestor de la Rosa. His parents had brought him to the U.S. from Mexico when he was a child, and he had stayed in the country as a “Dreamer,” on a Deferred Action for Childhood Arrivals waiver, while working toward an advanced degree at Wichita State. Trump carried Dodge City more than two to one. But people we spoke with there after the election said they never intended their preference in national politics to lead to the removal of trusted figures like de la Rosa. You could use the Dodge City story for snark: What did Trump supporters think they were voting for? Two days after the election, Deb and I were in Wyoming, where Trump beat Clinton more than three to one. Most people we interviewed there were happy about his victory—but hoped it would not lead to either an interruption in NAFTA, which was important for their exports, or a change in the availability of an immigrant labor force. Yes. But to us the incoherence of these views said less about the people holding them than about the gulf between many Americans’ outlook on national partisan issues—polarized, tribal, symbolic—and the practical-mindedness with which most people in most regions approach decisions about their own communities. Dysfunction at the national level genuinely is a problem, as the world is reminded every time the federal government shuts down. Some of that pathology has spread to the state level. But for us the American story was of a country that is still capable of functioning far more effectively than national-level paralysis would indicate or than most people unaware of the national patterns we are reporting would assume about the parts of America they’re not in. Through the next year, go to half a dozen places that are new to you, and that are not usually covered in the mainstream press. When you get there, don’t ask people about national politics. Trump, Hillary Clinton, the Russians, the Mueller investigation—if it’s on cable news, don’t ask about it. Instead ask about what is happening right now in these places. The schools, the businesses, the downtown, the kind of people moving out and the kind moving in, and how all of this compares with the situation 10 years ago. This process, repeated again and again, led us to the perspective I am presenting here. The more we traveled, the more parallels and resonances we saw. This public-art project in southern Arizona was like that other one in Maine. This library program in Oregon was like that one in Ohio. This creative public school in California was like that one in Georgia. This conservation effort in Montana resembled others in California, and Louisiana, and Idaho. This “civic tech” project we heard about in Massachusetts was like the ones we learned about in Indiana and in Southern California. Every place had its local features, but together those efforts formed a pattern whose sweep and power can be hard to discern from any single instance. Recognizing that these emerging networks exist in parallel is important in practical terms, so that people can share examples of success, plus increase the networks’ collective leverage. It matters at least as much in outlook. It’s one thing to work in what you imagine to be a lonely outpost, defending yourself against decline all around. It’s different and more exhilarating to know that you are part of something bigger, and that you are going down a path others have helped blaze. Now I understand it as a tangible thing. Early in our travels I received a note from a young man who had moved from a big coastal city to a town in North Texas. “If you want to consume a fabulous community, you could move to some place like Brooklyn,” he said—or San Francisco, or Seattle, or Paris, or Amsterdam, or any other glittering site with restaurants, parks, vistas, and public spaces to enjoy. “If you want to create a great community, you move someplace that needs your help,” like his new hometown. Creating in this sense means taking responsibility for the invention and sustenance of the community in which you’d like to live. The idea of engagement, then, boils down to sharing responsibility for the world outside one’s individual household. Any step in that direction—as modest as voting or attending PTA meetings, as dramatic as running for office or leading a group to deal with local problems—is a step that encourages civic creation, not just consumption. And the evidence of past waves of reform, from the labor-rights and women’s-suffrage movements of the early 1900s through the civil-rights and environmental movements of mid-century, suggests that national transformations must start from local roots. Third is correcting perceptions and dealing with what is already recognized as a national emergency: the distorted picture of events beyond our immediate experience that comes through the media, professional and informal alike. The strain on local media, whose effects we saw everywhere, is an important part of this distortion. One to-do step for citizens: Subscribe to local publications while they still exist. A to-do step for plutocrats and philanthropists: View news-gathering as a crucial part of the public infrastructure of this era, just as Carnegies, Rockefellers, and Mellons viewed libraries, museums, and universities as part of the necessary infrastructure of their time. The most urgent place to start would be with local and state-capital newspapers, which have been even harder hit than national publications by the evaporation of journalism’s late-20th-century economic base. The challenge of journalism is always to make what’s important interesting. This is hard enough in the best of circumstances. It’s harder when the reality you’re conveying involves a mixture of developments both encouraging and alarming, rather than a stark exposé or a success story. It’s harder still when the reality involves TV and video. And it is nearly impossible in the case of cable-news channels, above all politically driven ones like Fox. What 24-hour cable news introduced and Fox perfected in the modern news consciousness is an unending stream of horrors from … somewhere else. The natural result of well-meaning liberal media is thus a kind of pity for the heartland, and of conservative media, a survivalist fear about what people Out There are trying to get away with. The problems of journalistic proportion hardly began with the last presidential campaign. You name a decade from the 1700s onward, and I can show you an essay on the failings and pernicious effects of the contemporary press. But those defects crest in certain eras, and Americans’ inability to see clearly the state of their nation represents one of those dangerous peaks now. A clear view of the America of this era contains serious perils, like always, but also more promise than at many other times. Through the long saga of American reinvention, the background question has been the one Benjamin Franklin is said to have pondered at the Constitutional Convention when looking at a painting of the sun on the back of George Washington’s chair. As the Constitution was being signed, Franklin declared that he had “the happiness to know” the sun was rising. It can rise again, and across the country we have seen rays of its new light. SUBHEAD: The International Monetary Fund says banning foreigner home sales discriminatory (against super rich people). The International Monetary Fund has criticized New Zealand’s “discriminatory” ban on home sales to foreigners, saying it’s unlikely to improve housing affordability. 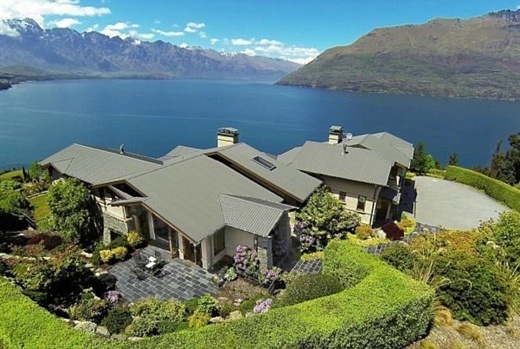 “Foreign buyers seem to have played a minor role in New Zealand’s residential real estate market recently,” the IMF said in a statement Tuesday, after concluding its annual Article IV mission to New Zealand. If the government’s broader housing policy agenda is fully implemented, that “would address most of the potential problems associated with foreign buyers on a less discriminatory basis,” it said. The new Labour-led government has pledged to fix the nation’s housing crisis with a raft of measures, including a ban on foreign speculators buying residential property, removal of tax distortions and an ambitious building program. House prices have surged more than 60 percent in the past decade amid record immigration and a construction shortfall, shutting many out of the housing market. However, data suggest non-residents buy only a tiny percentage of homes sold, and critics of the law change say it will have the unintended consequence of worsening housing supply by turning overseas investors away. Proposed changes to the Overseas Investment Act, which the government says will bring New Zealand into line with neighboring Australia, will classify residential land as “sensitive,” meaning non-residents or non-citizens can’t purchase existing dwellings without the consent of the Overseas Investment Office. While non-resident foreigners will be allowed to invest in new construction, they will be forced to sell once the homes are built. IMF Mission Chief Thomas Helbling said a ban is a “very definitive measure” and could send a negative signal to foreign investors more broadly. Economic growth to remain around 3% in the near term, risks broadly balanced. Soft landing in housing market should continue. Monetary policy appropriate; the IMF warns against precautionary further easing or premature tightening. With household debt still elevated, RBNZ shouldn’t relax mortgage lending restrictions any further. The country’s fiscal position is “strong” and there is no need for faster debt reduction beyond what the government has already outlined. SUBHEAD: Rain storms have done more damage this spring to our north shore than in more than a generation. 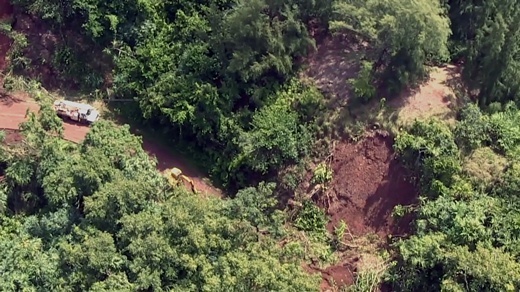 Image above: Only public road along the north shore of Kauai in Waikoko is obliterated by landslide west of Hanalei Bay. Click to enlarge. Still image from video below. Living in Kauai on the south side of Kauai we have missed he destruction of storms that destroyed much of the communities and infrastructure on our north shore. The impact has been tremendous for residence there; homes destroyed and roads wiped away. As much suffering as this has caused and the long term difficulties that will linger, there is a thin silver lining in the darkened clouds. The army of tourists in rented cars making the obligatory daily pilgrimage to Kee Beach crowding the roads, overflowing the parking lots and trampling the land has been temporarily halted. When the roads are repaired and northshore tourism resumes we hope it is under new circumstances that would restrict tourist cars from anywhere west of Hanalei Bay. There was a feeble attempt to due this in the recent pass, but the will to disappoint tourists simply collapsed. Here on the south shore we have noticed traffic through Hanapepe has increased significantly since last spring. Some of this is due to more rush hour traffic, presumably from the GMO companies and the PMRF (Pacific Missile Range Facility). We have a regular weekday 3pm eastbound rush hour never seen before. Moreover, our local county beach, Salt Pond Beach Park, has been overrun by tourists since for over six months. This is certainly been in part because of the destruction of subtropical vacation destinations in the Caribbean. In the last hurricane season there were 5 category-five storms that destroyed beaches, resorts, roads and much of amenities that attracted visitors. Puerto Rico is still suffering from island-wide blacked-outs. And here comes another hurricane season. There seems to have been a bit of a campaign to make Salt Pond a heavier used visitor destination as well. Salt Pond is now rated online as a top beach for tourists. This take may take some pressure of totally overrun Poipu Beach Park and other crowded locations, but it is has unanticipated effects. Salt Pond has historically been a "local" beach used as an outdoor living/rec room for many local families from the westside. Birthdays, weddings, graduation parties, spear-fishing surf-casting, BBQs and minding the kids and just kicking back with a beer after work has been the usage. There is also and tradition of people temporarily living in tents (mixed with tourist camping) that helps transition (some people I've known) through a job loss, breakup or other temporary difficulty. Anyway, I continue to hope jet plane enabled mass tourism to Hawaii ceases for two primary reasons. Is is destroying Kauai and it is destroying the atmosphere. I have not flown to the mainland in several years and have no plans to start again. Video above: Hawaii Department of Land & Natural Resources damage assessment of storm damage on several videos of the North Shore of Kauai. For more videos visit Vimeo site (https://vimeo.com/265509802). SUBHEAD: Let’s pause to make an assessment of where we stand as Winter finally coils into Spring. Image above: A man waits at dawn, after sleeping in his car, to see a free ‘mobile doctor’ in Olean, New York. Photo by Spencer Platt. From (https://www.theguardian.com/inequality/2017/jun/20/is-the-american-dream-really-dead). America has become Alzheimer Nation. Nothing is remembered for more than a few minutes. The news media, which used to function as a sort of collective brain, is a memory hole that events are shoved down and extinguished in. An attack in Syria, you ask? What was that about? Facebook stole your…what? Four lives snuffed out in a… a what? Something about waffles? Trump said… what? As you might expect, a nation overrun with lawyers has litigated itself into a cul-de-sac of charges, arrests, suits, countersuits, and allegations that will rack up billable hours until the Rockies tumble. The best outcome may be that half the lawyers in this land will put the other half in jail, and then, finally, there will be space for the rest of us to re-connect with reality. What does that reality consist of? Troublingly, an economy that can’t go on as we would like it to: a machine that spews out ever more stuff for ever more people. We really have reached limits for an industrial economy based on cheap, potent energy supplies. The energy, oil especially, isn’t cheap anymore. The fantasy that we can easily replace it with wind turbines, solar panels, and as-yet-unseen science projects is going to leave a lot of people not just disappointed but bereft, floundering, and probably dead, unless we make some pretty severe readjustments in daily life. We’ve been papering this problem over by borrowing so much money from the future to cover costs today that eventually it will lose its meaning as money — that is, faith that it is worth anything. That’s what happens when money is just a representation of debt that can’t be paid back. This habit of heedless borrowing has enabled the country to pretend that it is functioning effectively. Lately, this game of pretend has sent the financial corps into a rapture of jubilation. The market speed bumps of February are behind us and the road ahead looks like the highway to Vegas at dawn on a summer’s day. Tesla is the perfect metaphor for where the US economy is at: a company stuffed with debt plus government subsidies, unable to deliver the wished-for miracle product — affordable electric cars — whirling around the drain into bankruptcy. Tesla has been feeding one of the chief fantasies of the day: that we can banish climate problems caused by excessive CO2, while giving a new lease on life to the (actually) futureless suburban living arrangement that we foolishly invested so much of our earlier capital building. In other words, pounding sand down a rat hole. Because none of that is going to happen. The true message of income inequality is that the nation as a whole is becoming incrementally impoverished and eventually even the massive “wealth” of the one-percenters will prove to be fictitious, as the things it is represented in — stocks, bonds, currencies, Manhattan apartments — hemorrhage their supposed value. The very wealthy will be a lot less wealthy while everybody else is in a life-and-death struggle to remain fed, housed, and warm. And, of course, that only increases the chance that some violent social revolution will take away even that remaining residue of wealth, and destroy the people who held it. What lies ahead is contraction. Of everything. Activity, population. The industrial economy is not going to be replaced by a super high tech utopia, because that wished-for utopia needs an industrial economy underneath to support it. This is true, by the way, for all the other “advanced” nations. China has a few more years of dependable oil supply left and then they will discover that they can no longer manufacture solar panels or perhaps not even run the magnificent electronic surveillance system they are so artfully building. Their political system will prove to be at least as fragile as our own. The time may even come when the young people, of the USA especially, have to put aside their boundary-smashing frolics of the day and adjust the precooked expectations they’ve been handed to the actual contraction at hand, and what it means for making a life under severely different conditions. It means, better learn how to do something really practical and not necessarily high tech. Better figure out a part of the country that will be safe to live in. Better plan on hunkering down there when the people stuck in the less favorable places make a real mess of things. SUBHEAD: Here’s what one of America’s most isolated communities can teach us about getting along. Image above: Hutterite women dress with bonnets often or polka dot scarves. From original article. The educator and photographer learned of the reclusive ethnoreligious group while researching a book on ranch life in central Montana. Locals told her that if she wanted to see what good farming looked like, she ought to visit the Hutterites. That advice would change the way she thought about life and inspire a portfolio of photos titled “Hidden in Plain Sight,” which captures the world within these small, ultra-traditional religious communes. The Hutterites were not Brody’s first exposure to people from isolated rural areas. At a young age, she had traveled from New York to North Carolina to attend summer camp. “There were all these nice Jewish kids from New York, and most of the counselors were from the Deep South,” she said. Many of them had limited education, which Brody said she and her youthful peers mistook for a lack of intelligence. With age and experience, Brody came to realize that she had misjudged them and the wisdom and ingenuity demanded by rural life. “They were pretty amazing people,” she said. Decades later, she found herself living and working among some other pretty amazing people in one of America’s most isolated communities. 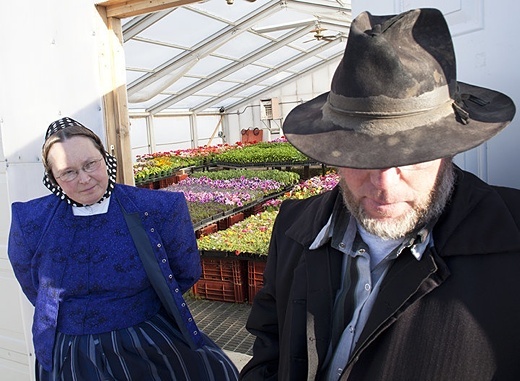 Image above: Hutterite husband and wife outside community greenhouse. From original article. 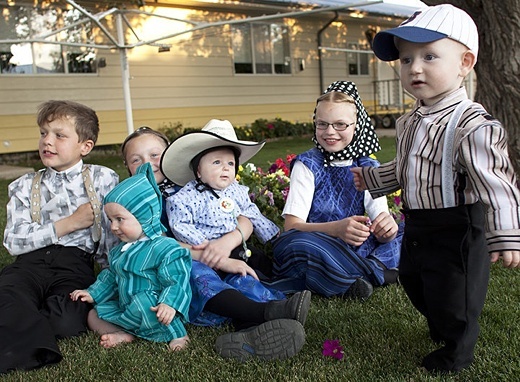 The Hutterites are Anabaptists ― Christians who believe people should be baptized not as infants but only when they are old enough to confess their sins and choose baptism for themselves. They fled persecution in Austria during the Protestant Reformation and eventually ended up living across parts of North America’s Great Plains. 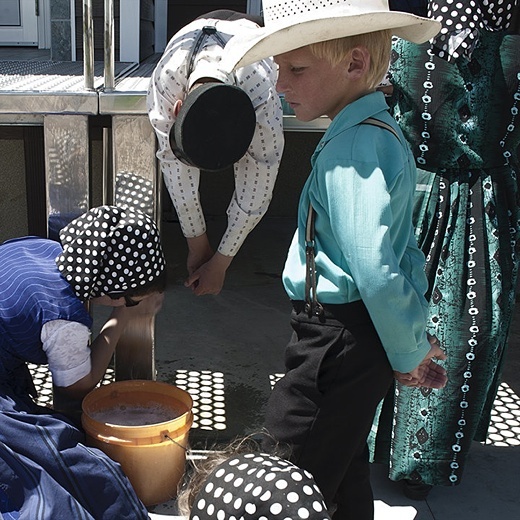 According to National Geographic, there were roughly 40,000 Hutterites living in 480 colonies in the U.S. and Canada as of 2012. The group is named for a 16th century leader, Jakob Hutter, who preached the tenets of pacifism and communal living. Nearly all property in a Hutterite colony is owned by the colony ― a practice that differentiates them from other rural religious communities, such as the Amish and Mennonites. Unlike the Amish, the Hutterites utilize various forms of modern technology. They generally sustain their communities through industrial agriculture, selling frozen meat, chicken, eggs, milk and vegetables to large local grocery chains. But she took up an offer from some other area residents to introduce her. She did know that the Hutterite communities were insular, highly patriarchal and guided by strict religious tenets. Brody, who is not religious, wasn’t expecting to enjoy herself. She eventually spent four years photographing the group and learning about their lives. Image above: Hutterite boys and girls help cleaning farm equipment and doing chores. From original article. “For whatever reason ― maybe it’s the way I am or the way they are ― there was space made for me to come and do something which they don’t normally like people doing, which is taking pictures of and being with them,” she said. 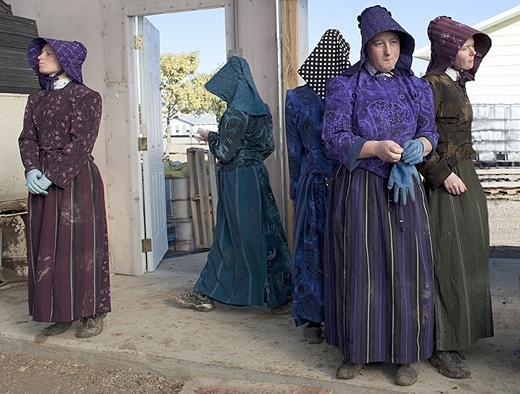 Brody photographed three separate Hutterite colonies in Liberty County. Her work honors the many technical skills that allow the communes, which she said consisted of about 150 people each, to function. But more profoundly, it captures the relationships that develop when a community is simply too small to allow itself to become divided. It’s a principle the Hutterites are committed to living by, no matter how difficult a situation or personality they encounter. The Hutterite women accommodate one another’s individual differences in order to protect the health of the entire community. When a person is destructive or obnoxious or insolent ― either in personality or in reaction to the community’s rules ― the group adjusts their expectations. This creates a space for the disruptive person to function within the community and, perhaps, create a path to contentment they may not have otherwise found. Image above: Younger Hutterire children playing in the grass. From original article. Tolerance is not the first thing one expects to find in a community that rejects almost everything outside itself. But when nothing from the outside world is allowed in, they have no choice but to cherish and protect each other. “That’s a huge lesson this country has completely forgotten,” she added. Below are Jill's thoughts on her time with the Hutterites and the lessons she believes they can teach us. 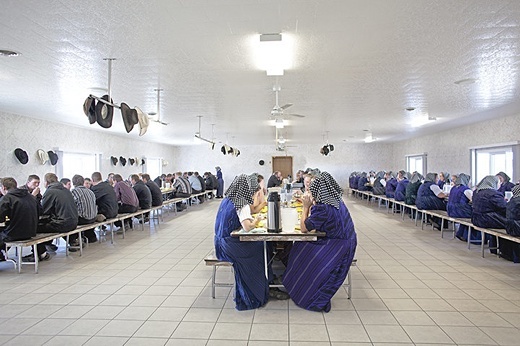 Image above: Members of a Hutterite colony eat a communal dinner segregated by gender. From original article.